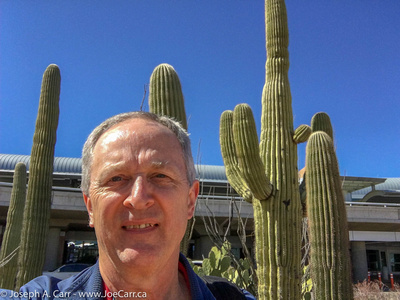 2018.02.23 Friday – Depart Tucson – flight delays and cancellations! I take my time this morning in the hotel, going for breakfast around 8AM and then taking a walk around the neighbourhood, knowing that I’ll be sitting in airports and airline seats for most of the afternoon and evening. I also text Angel to coordinate the return of the Tesla Model S I rented. I check out of the hotel just before noon and drive over to the airport’s short term parking lot. I contact the Telsa’s owners to let them know I’m ready to return the car to them. They tell me they are on their way, but don’t show up. After an hour of waiting, I leave them a voice mail and eventually they tell me to just leave the car where it is and they will remotely lock it and pick it up later. They could have told me that up front – very poor communication on their part! The trip display in the vehicle shows that I drove 666.5 miles, used 189 kWh of electricity, and averaged 284 Wh/mi energy consumption. So if I was paying for the electricity to power the car, it would have cost me about $20! I check in with Delta airlines and see that my boarding pass shows the departure time for my flight from Tucson to Seattle is delayed to 6:25PM (was 3:55PM). 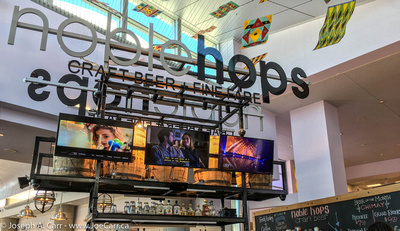 Before going to the gate, and knowing how much of an actual delay I’m dealing with, I decide to have a meal at Noble Hops, a bar/restaurant by the Delta ticket area. They serve very nice craft beer on tap, so I have a delicious Shepard’s Pie with my Dragoon IPA – the bill comes to US$37 (CAD$40)! I know the airline won’t be serving meals, so I will at least have one good meal under my belt to keep me going on what it looking to be an endurance contest. I proceed through airport security and find my gate, the estimated departure time has slipped yet again to 8:00PM. At this point, the gate staff rebook me to the last flight out of Seattle for Victoria at 11:17PM, arriving in Victoria at midnight. Our aircraft is still stuck in Seattle due to bad weather, and will have to be de-iced for a second time before they depart, which means it will be 9:10PM before it will depart Tucson back to Seattle. That means I’ll miss my connecting flight to Victoria and I will have to overnight in Seattle. I hate airlines! The gate staff are doing their best by offering free snacks and beverages. They hand me three meal coupons worth $15 each for breakfast, lunch and dinner in either Tucson or Seattle airport. I go down a couple of gates and find a bar that serves food and order a grilled chicken sandwich, using one of the coupons. Several of the passengers on my flight are at the bar drinking. After all this, the aircraft finally pulls away from the gate at 9:15pm. It will be a 3 hour and 11 minute flight according to the onboard announcement. This is an Embaerer aircraft, which means it’s small: one isle with two seats on either side, small overhead compartments, and the seats are quite cramped. Once we are clear of Tucson, we fly through some very rough air while the crew try to serve beverages. It never fails! The captain takes the aircraft to a lower flight level, which smooths things out considerably. I watch a movie using my iPad and Wi-if through the Gogo inflight network for free: “Pirates of the Caribbean- Dead Men Don’t Tell” – the first movie I’ve watched all the way through for probably a decade! Orion and the Crescent Moon are visible off the wing to the west during the last hour of the flight. Once we land in Seatac, the fun begins. My big bag is checked through to Victoria, so it doesn’t appear on the carousel. I go to the Delta Baggage office nearby, and thank goodness a woman is still there despite it being after midnight. She advises me to go upstairs right away in order to arrange for an overnight hotel with the Delta agents before they go home. There are no agents to help me upstairs, so I return to the baggage office. I try calling the Delta Customer Assistance number, but nobody answers – so much for customer service or caring! The baggage clerk indicates this is not something she normally does, but she makes a call and has someone walk her through issuing me with a hotel coupon for the Red Lion Inn in nearby Renton. By that time, her co-worker in the back has located my bag and put it on the nearby carousel for me to pick up as I go to the hotel shuttle area. I manage to squeeze into the last seat in the shuttle that is about to leave with my fellow Delta passengers, taking us on a 20-minute drive from the airport.. The night clerk at the hotel slowly checks all of us in. The hotel is no great shakes, but it is clean, and after turning the heat up and having a quick shower, the bed feels good! I’m booked on a 1:05PM flight to Victoria, so I can sleep in before going downstairs for breakfast. There is a buffet, but I prefer to have a vegetarian omelette along with the rather mediocre coffee. I check my Starbucks app, but there isn’t one close by and I don’t see any other coffee shops in the mall the hotel is located in, so no cappuccino for me this morning! I take the 9:30AM shuttle back to Seatac airport, since the hotel isn’t running any more shuttles after that until after lunch. I have to clear security without the TSA Pre-clearance I usually have on my boarding pass, however I have lots of time, and the procedure isn’t too stressful. The flight leaves on time and I’m back in Victoria airport an hour later. My bag appears on the carousel, I clear Canadian customs and immigration in under a minute and take a shuttle back to town. They drop me off a few blocks from home, so I slowly walk home, and I’m greeted at the door by the dogs. I make myself a cappuccino before unpacking. My daily routine resumes tomorrow! This entry was posted in Arizona, British Columbia, Canada, USA, Washington state and tagged airline, airport, food, hotel. Bookmark the permalink.